The promotional two seaters lawn swing offers a good sturdiness and an interesting comfort for two people. The steel frame assembly is easy, do not require any effort and much time. This item doesnt need large place to fit in. It is a must for every one willing to relax with a close friend. Great for condos. Share special moments in your backyard with the PNT-532-S patio swing from CorLiving. 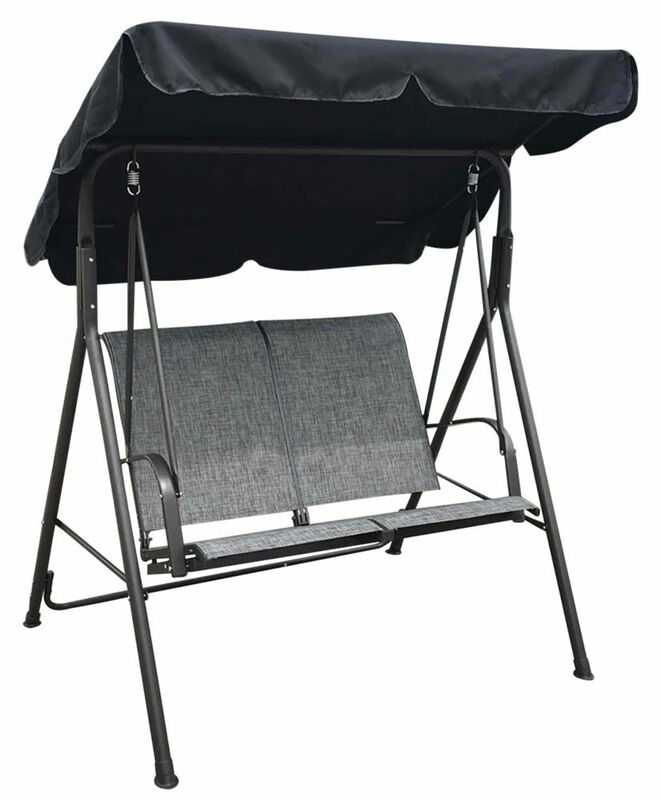 The weather resistant shade canopy and cushions are secured by a sturdy powder coated charcoal steel frame. The 3-inch foam cushions give you an incredibly comfortable seat or can fold down flat to create a space to enjoy a nap. This patio swing is easy to assemble, which means you can enjoy a relaxing afternoon on your patio in minutes. Enjoy the outdoors while swinging on this two seater swing. This swing has a steel frame with 2x2 textilene. The size of the swing is 63 x 57.9 x 71.6 inch. The frame color is black. The textilene color is red. Gazebo Swing is the perfect place for tranquility and relaxation. Have a seat on this comfortable polyester swing chair and let the breeze gently sway you back and forth. The frame is made of durable powder coated steel with a water resistant canopy for extra shade. Black Frame With Red Cushions and Pillows This patio swing comes with a gazebo frame and mesh screens that will allow you to have shade and enjoy the sun without overheating and and keep out any unwanted insects. You can enjoy it with friends in the upright seated position or you can turn it into a swinging daybed where you can lay back and stretch out. When reclined, the swing can be locked so it will not swing if that is what you desire. You will be able to comfortably sit and swing with up to three people. Size: 98.5 x 59 x 98.5"
You will feel like you are in your own paradise when you relax in the classy Sunjoy Corona Swing Chair. The sophisticated swing chair is a hammock and lounger rolled into one. With a light colored fabric sun roof and cushioned recliner, you will want to stay all day in the swing chair sipping on cool summer drinks. The swing reclines with the area for the legs raised providing optimal comfort. Two small arm rests offer additional comfort. Straps on either side of the swing chair keep it from swaying too far. Four wide legs provide stability. The frame is made of strong and durable steel. The cushion and head rest are removable and have straps to secure them to the swing chair frame. The fabric is weather resistant and easy to clean and maintain. The Corona Swing Chair stands 82.7 inches tall, is 37.8 inches wide and 47.2 inches long. Promote Two-Seater Patio Swing The promotional two seaters lawn swing offers a good sturdiness and an interesting comfort for two people. The steel frame assembly is easy, do not require any effort and much time. This item doesnt need large place to fit in. It is a must for every one willing to relax with a close friend. Great for condos. Promote Two-Seater Patio Swing is rated 4.8 out of 5 by 15. Rated 5 out of 5 by Beew from Perfect The swing fits perfectly on our porch and we enjoyed swinging with our 2 yr old grandbaby who loves swings, when she visited PEI this summer. Rated 5 out of 5 by elizabeth from GREAT PRODUCT!!!! really good quality 2 seater. very comfortable. relaxing to swing back and forth. heavy duty steel. very secure. not at all tippy. I have a bad back but find this very comfortable. looks great. Rated 5 out of 5 by tessi2pa from Great purchase We purchased this as a father's day gift for my Dad who is 87. He loves to sit on the deck and rock and read. It took about 30 minutes for two of us to put it together and looks very nice. We have had an extended stretch of high wind days and Dad was worried we should remove the sun shade but it was not affected at all. The seat is comfortable and easy to wash. We have only had it a couple months but the material looks like it will hold up well exposed to the summer elements. Good value. Rated 4 out of 5 by Mochline from Good purchase Bought this swing at the beginning of summer and have enjoyed it a lot since. The only negative point for me is that it is a little narrow, wish it was wider when two persons are sitting. Rated 4 out of 5 by Swingin from Great swing for small space. Perfect for small spaces. Light weight and does topple over in wind. Great price. Overall...LOVE it!! I got shipment today and opened and part number reference on parts( like A,B,C...) does not match to part numbers on instructions manual. What should I do? Yup, same problem here. Worked it out but what SHOTTY instructions.